Use McCormick Ancho Chile Pepper to enhance recipes by adding a sweet, fruity and earthy flavor with mild heat. Ancho is the most used of the dried chiles and is called Poblano when fresh. Ancho Chile Peppers are reddish-brown in color and are grown in the Central Region of Mexico's. The word 'Ancho' translates to English as "wide" and in its whole form the Ancho Chile Pepper is shaped like a heart. It is one of the largest Chiles. Sprinkle Ancho Chile Pepper on pasta dishes, pizza sauces and tomato based sauces. Shake McCormick Ancho Chile Pepper on tacos, burritos and fajitas for extra flavor. 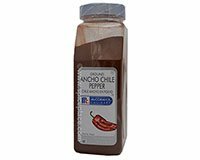 Add Ancho Chile Pepper to salsas, rice, mashed potatoes and homemade bread croutons. Ingredients: Ancho Chile Peppers and Silicone Dioxide (Added To Keep Free Flowing).